Chances are, you didn’t plan your trip knowing you would have to cancel it, or cut it short. You may realize that there’s a possibility that a family member may get sick, a weather event may occur, or your airline may go on strike, but you plan ahead anyway, booking travel and paying trip deposits. That’s when trip cancellation, trip delay and trip interruption coverage is helpful. However, many travelers do not understand what the difference is between each of those types of coverages. Trip Cancellation is one of the more common travel insurance claims filed, and is one of the main reasons people purchase a travel insurance plan. While no one plans on having to cancel a trip once we book it, the unexpected can happen. Travelers who want coverage for cancellation reasons beyond those that are included in a base Arch RoamRight policy may be able to purchase the Cancel for Any Reason optional upgrade. Insure all of your trip deposits that are subject to cancellation penalties. The Cancel for Any Reason upgrade is available with the Preferred, Elite, Pro, and Pro Plus plans. While Cancel for Any Reason is not available to residents of New York, they have similar coverage under a benefit called Cancel for Fortuitous Reasons. Please contact customer service or see your policy for specific details. Those who are concerned about having to cancel for work-related reasons can also purchase the Cancel for Work Reasons optional upgrade. Cancel for Work Reasons allows you to cancel your trip for reasons such as being forced to work during your previous scheduled vacation, being transferred to a different city, and others. Please note that Cancel for Work Reasons is not available for individuals who are self-employed, or are company owners or partners. The Cancel for Work Reasons upgrade is available with the Preferred, Elite, and Pro plans. With the Pro Plus plan, Cancel for Work Reasons is automatically included at no additional cost. One common example of a Trip Cancellation claim that we see involves families having to cancel their trips as a result of a sick child. The video below is based on a real story from an Arch RoamRight traveler who had to cancel their trip after their daughter got strep throat when they were supposed to depart. Since a claimable Trip Interruption event can happen at the start or the middle of your trip, there are a number of examples of this type of coverage being applicable. A common example of Trip Interruption is for travelers flying to a port of embarkation for a cruise. If the flight is delayed for a covered reason and it is long enough to force you to miss the cruise departure, the Trip Interruption benefit can reimburse you for unused, prepaid non-refundable payments or deposits for your land or water travel arrangements, plus the additional cost paid to either join your cruise or travel via alternate travel. Another example is when you are on your trip, enjoying your vacation and you receive bad news from back home. If it is for a covered reason* and you need to return home immediately, trip interruption will help pay for the difference in costs in airfare and transportation, as well as any unused, pre-paid non-refundable payments or deposits. What do Trip Cancellation and Trip Interruption benefits cover? As with any case, check your policy details to make sure you understand how the coverage works specifically for the policy you purchased. for Other Covered Events, as outlined below. This is an abbreviated list of the most common covered events for trip cancellation or interruption. For coverage, an event must be unforeseen at the time of purchase. For a full list of events and coverage details, please refer to the policy. What is Trip Delay Coverage? 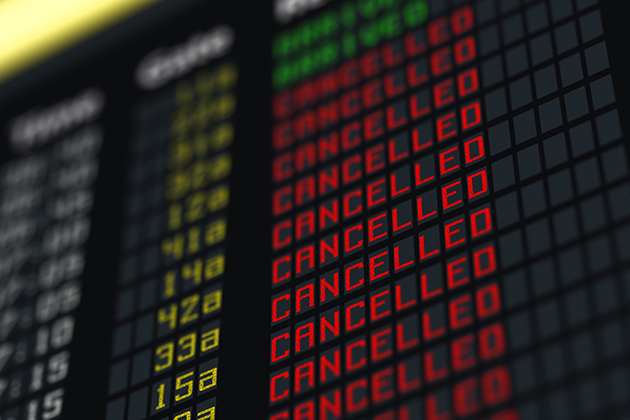 It is common to see Trip Delay claims related to airline delays. With air travel being unpredictable and often influenced by weather and other factors, a severe delay in your flight can force dramatic changes for your scheduled trip. For long flight delays, travelers may be forced to spend money that they didn’t anticipate spending, such as buying an additional meal at the airport or spending a night at the hotel to take a flight rescheduled for the next day. Under your Trip Delay benefit, you can be covered for those related expenses. What do Trip Delay benefits cover? *These covered reasons, as well as exclusions and limitations, can be found in your policy.